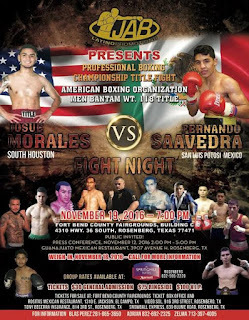 Press Release: November 14, 2016 Houston, Texas- JAB Latino Promotions will be putting on their first boxing card November 19th at the Fort Bend County Fairgrounds in Rosenberg, Texas. 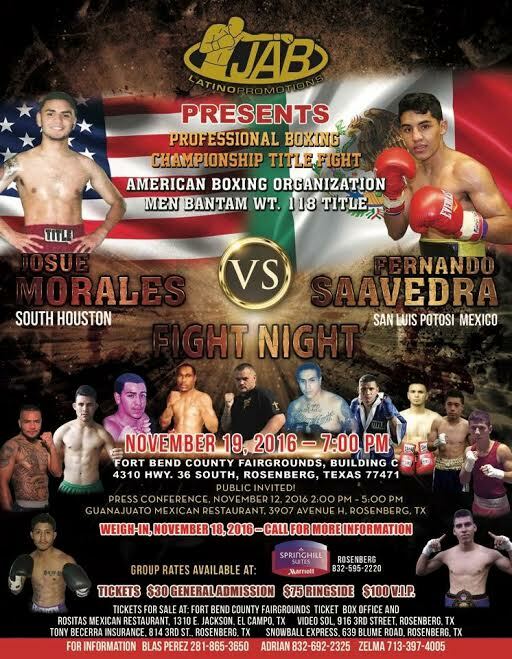 The main event will feature Houstonian Josue Morales as he is set to face Mexico’s Fernando Saavedra for the American Boxing Organization’s Bantamweight title. In the co-main event features Jose “Canelito” Garcia as he takes on Chris Faz in lightweight action. In the opening bout, will be middleweight Daniel Lopez from Houston making his debut against Jesus Rodriguez of Brownsville Texas. 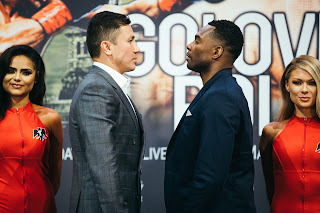 Making his return to the ring is 4-time Golden Glove winner Artrimus Sartor of Cincinnati Ohio looking to put another notch in the win column. Sartor who lost in his last outing wants to go out and put a show on for area boxing fans. “I have fought in Galveston and Beaumont and love putting on a show for the fans, wherever.” Also in action is top Houston prospect Cruiser-weight Roberto Silva as he continues to establish himself in the division. Doors open 6pm on November 19th, at the Fort Bend County Fairgrounds in Rosenberg, Texas. For ticket information contact Blas Perez 281-865-3650. JAB Latino Promotions is a Houston area boxing promotion company that has one mission statement: Put on exciting, crowd-pleasing and competitive matches while providing a platform for prospects. Which Event Will You Order?